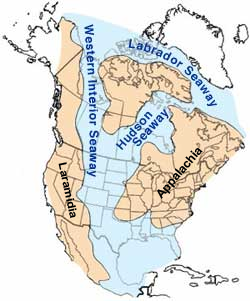 The North American inland or the Western_Interior_Seaway sea was a large inland sea that dominated much of the North American continent during the Cretaceous. Laramidia was the western island and Appalachia was the eastern island. So how would the climate of North America change, I personally think continental climates across the continent will cease to exist and the Oceanic type climates will expand to all coastal areas across landmass. I assume there'd be no Rockies. Would we still have the Pacific Coastal Ranges (Sierra, Cascades, BC Coast)? Sorry forgot to say, the rockies are the same height as currently, the Appalachians are also the same height. That would be difficult to imagine as most of them are underwater in your map. Well then the pacific coastal ranges will still exist..I'm not too familiar with all the mountain chains there. All I know is, if there is a large body of water in that area and it freezes over in the winter, then any west wind will bring some real frigid air to the east all the way to the coast. So you don't think North America would be more oceanic/moderate? If the flow of the water is north to south wouldn't ice flow south ward and cool off the water? So I dont think that river of water in your senario would be a warm body except in the gulf but even that would cool down. Then once winter rolls around and we get the layer of water to freeze any wind riding on top of this 10,000 foot deep water would cool the entire lower 48. Just my take on it. I think the arctic would actually become warmer due to the nee connection.with the gukf of mexico. Continental climates woukd cease to exist, the forests of North America would expand and deserts will shrink. I'm guessing oceanic climates would dominate much of North America. I doubt the new sea would be a warm body of water just a moderating one.